This spring, the Supreme Court is expected to rule on a case called Janus vs. AFSCME [American Federation of State, County and Municipal Employees], an attack on public sector unions led by the right-wing National Right to Work Foundation and funded by billionaires and corporate CEOs. With Tru mp’s appointee, Neil Gorsuch, on the Court, their ruling will undoubtedly overturn a 40-year-old unanimous Supreme Court decision that approved the kind of cost-sharing arrangements known as “fair share”, which provide for the collection of “agency fees” from non-members of public sector unions. Unions will still be required to represent ALL employees in the workplace, but will only receive financial support from union MEMBERS with signed union membership forms on file. All unionized public sector workplaces will become “right to work” sites. 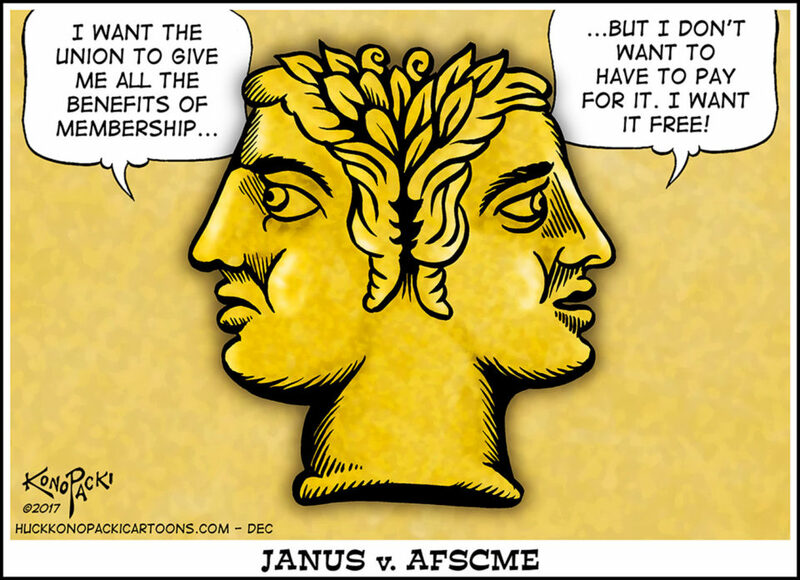 The results of the Janus decision could be devastating to unions, which currently rely on both dues and fees to pay the costs of the legal defense of workers, to staff and maintain union offices, and to carry out all the other activities necessary to represent, inform, negotiate contracts, and ensure contracts and workers’ rights aren’t being violated. Under current law, while every union-represented teacher, police officer, caregiver or other public service worker may choose whether or not to join the union, the union is required to negotiate on behalf of all workers whether they join or not. Since all the workers benefit from the union’s work, it’s only fair that everyone chip in toward the cost. How does paying fair share violate free speech? 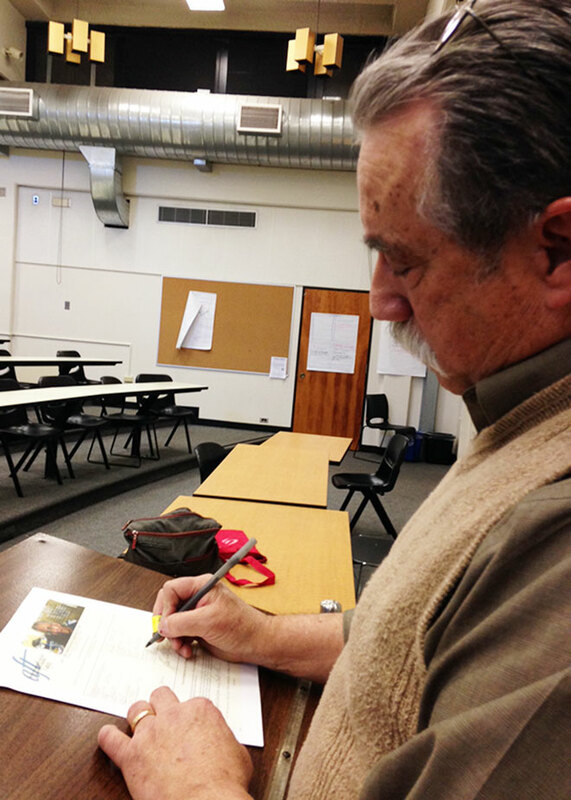 Under the current system, public employees can choose whether or not to join a union. First, workers vote on whether or not to form a union in the workplace. After a workplace majority votes for a union, workers who don’t want to join the union don’t have to; they just pay a reduced fair share (agency) fee to cover the cost of bargaining and representation that the union is legally required to provide to everyone in the workplace. However, full union dues go further, supporting political and legislative work because what can be won in collective bargaining can be taken away through politics and legislation. The Janus plaintiffs contend that their free speech is abridged by fair share fees, even though they are not paying for political advocacy. If you disagree with the outcome of a political election, you still pay taxes to the government. So, too, everyone needs to pay a fair share for the gains of union representation. When “free riders” pay nothing for the benefits all employees in a union workplace enjoy, others must shoulder that much heavier a burden and the union is weaker at bargaining time. Our union, AFT 1493, has been able to actively fight for stronger contract language and regular salary increases as well as workplace protections and the ongoing defense of faculty members under attack because our union membership is robust, at just over 85%, AND because we collect monthly dues and fees from all SMCCCD faculty members. 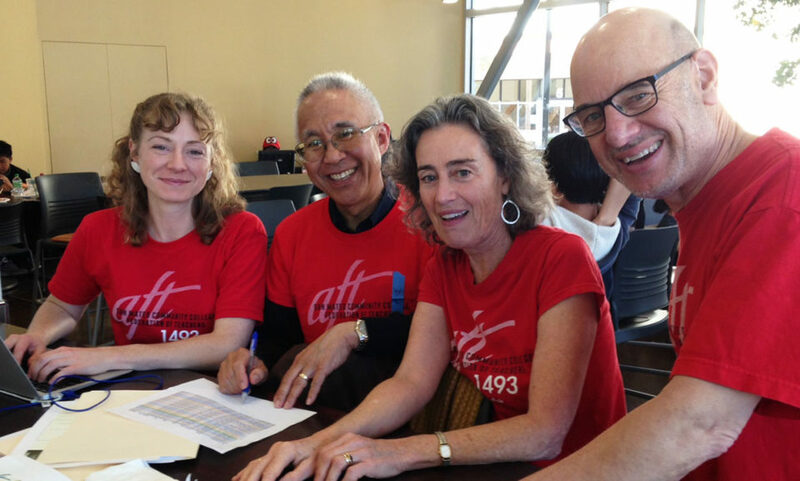 Our AFT union reps are on the ground, working with faculty to ensure our rights aren’t being violated, and we maintain a full-service union office, an award-winning website and newsletter, The Advocate, and many other services for faculty. Are you sure you are a union member? Starting this month, we are contacting people who we currently have on file as “Agency Fee Payers” to ask them to sign up to be full members. During the week of February 5-8 we conducted a targeted campaign, with the help of organizers from the CFT, asking non-members to sign up to support their union. We’ve found that a number of faculty think they are full members, and want to be full members, but don’t have signed membership applications on file in the AFT office and are designated as “Fee Payers.” Maybe they checked the wrong box when filling out the multitude of forms when they were hired. It happens. We’ve been working hard to get these faculty members signed up before the Janus case is decided. You can help by checking in with us and confirming that you are a full member of the union and that you have a signed form on file to safeguard your union membership and keep our union strong! The Trump agenda embodies an anti-worker, anti-union agenda. Our entire state of California has been the focus of repeated attacks on our values by this administration. California also has one of the highest rates of unionization in the United States. In this moment, being a full union member is one of the best ways faculty can exert continued resistance to the Trump agenda and to attacks on education in the future. Emily Rose (CFT staff member), Masao Suzuki (Skyline Economics professor), Katharine Harer (AFT 1493 Co-Vice President) and Eric Brenner (Advocate Editor) help sign up non-members at Skyline on Wednesday, February 7. 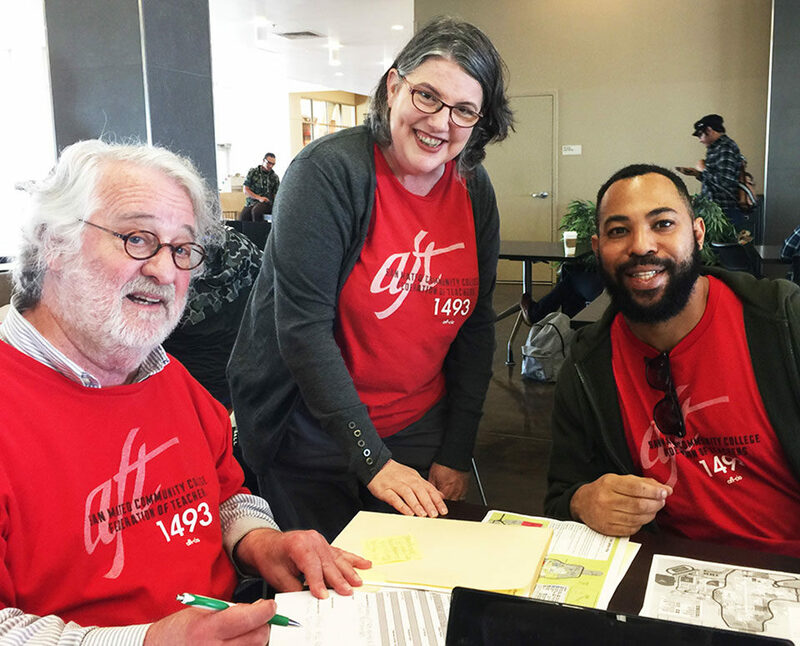 Dan Kaplan (AFT 1493 Executive Secretary), Michelle Kern (CSM Chapter Chair) and Seneca Scott (CFT staff member) work on the membership campaign on Thursday, February 8.